Innovate's new wideband / boost controller - Miata Turbo Forum - Boost cars, acquire cats. What type of boost controller is it? How does it compare to the EBC that a MS3x offers? It's closed loop. It is fairly basic - doesn't have things like timed boost from launch or some of MS3's other advanced features. More like an MS2 boost control. We haven't yet done a side by side comparison for consistency and ease of tuning. 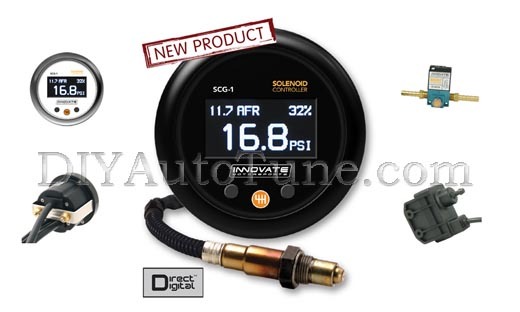 This package is pretty useful for someone who has a factory turbo car and wants to give it a bit more kick by adding two basics - a wideband and a boost controller - in one step, but is not as powerful as the options you'd get from MS3. So this is basically innovative's answer to the aem failsafe wideband + boost. So what i'm reading is... i can use this to set boost to ALLOFIT, and if it goes lean, it'll ramp boost back. I like this. Can start out tuning for max boost then come down until it's not lean anymore, instead of the other way around. I like the gauge. They selling one like that separately? Not that it matters since they'll price it right out of the market, like they did with the DB gauges. It was cheaper to buy the LC1 with the DB gauge, then sell the LC1 for $30 less than you paid for it, instead of paying $90 for a $30 gauge alone. I dunno, in my eyes I see it as complicating the issue by having TS for tuning and then using your Innovate to control boost separately, instead of TS for both. Unless I didn't read it closely enough and you can control the innovate EBC through TS. you wouldn't use this device with an aftermarket ecu. For a standalone boost controller I recommend sensing the boost in the intake piping just before the throttle body. This way it won't try to hit full boost at part-throttle. This solution is really more intended for those who don't have a standalone that can control boost.